Die CAG Forschung stellt sich bei BioMedCentral vor! Die CAG Forschung stellt sich bei BioMedCentral vor! Sehen Sie sich den Blog-Beitrag an, um mehr zu erfahren! The sequencing of the canine genome along with next generation sequencing technologies like whole exome sequencing have facilitated quicker, easier and more efficient identification of genes and mutations that can cause diseases in dogs. In a study published in Skeletal Muscle researchers have used these technologies to study a form of Limb-girdle muscular dystrophy (muscle wasting and weakness in shoulder and hip muscles) in Boston terriers. Here to tell us about the research and what this means for the breed is lead author of the study Melissa L. Cox. Dogs live with humans, and have access to medical care nearly as sophisticated as ours. We are also close in other ways: sharing approximately 85% of our genome – that is our complete sets of genes – any naturally occurring gene mutation that may cause a disease in dogs is likely to cause a similar condition in humans, and vice versa. Dogs can serve as models of human disease; for example, treatments such as gene therapy can be tried in dogs before going into clinical trials in humans, which can benefit both species. The sequencing of the canine genome greatly increased the speed and efficiency with which genes that cause disease can be detected. It has also facilitated research into the origin of dogs and the search for genes that underlie specific traits in dogs, such as height and skull shape, and many hereditary diseases. Next generation sequencing (NGS), including whole exome sequencing (WES) – technologies which allow geneticists to determine the precise order of nucleotides within DNA and RNA molecules much more quickly and cheaply than before –and the establishment of publically available databases has also allowed for easier identification of genes and mutations that may cause disease. Our group made use of these technologies to study a form of Limb-girdle muscular dystrophy (LGMD) in Boston terrier dogs. LGMDs are a varied group of Mendelian disorders – diseases caused by single genes that are inherited according to Mendel’s laws – characterized by muscle wasting and weakness in the muscles of the shoulders and hips. Four affected dogs from three unrelated families were identified by their primary veterinarians, and referred for specialized investigation. Clinical examination and pathology results confirmed that all affected dogs were suffering from LGMD, and immunohistopathological assays, which use antibodies that bind to certain tissues to reveal their presence, suggested a sarcoglycanopathy – that is a disease resulting from mutations in one of four genes that code for a certain type of protein, called a sarcoglycan. Sarcoglycanopathies are autosomal recessive, and have severe symptoms similar to Duchenne muscular dystrophy. There are six sarcoglycan proteins, four of which (α, β, δ, γ) are involved in structural and signal functions in muscle. The absence of the sarcoglycans from the muscle of affected dogs made the genes that code for these proteins our candidate genes, and whole exome sequencing allowed us to investigate them simultaneously. The group originally looked at four Boston terriers affected by LGMD from three unrelated families. DNA was available from two of the four dogs, and from several relatives of one of the dogs. Whole exome sequencing was performed on a total of 5 dogs, including the two dogs that had the disease and an obligate carrier – a dog that didn’t have the disease but which had to carry the gene mutation based on analysis of the family history. In one affected dog (Case 3), we found that two nucleotides – the buildings blocks of DNA – were deleted in one of the sarcoglycan genes. The dog’s obligate carrier parent and one other relative each also had one copy of the deletion. The other affected dog (Case 1) did not share this mutation, which was very surprising to us, given that they were the same breed. Breed structures limit genetic diversity, because dogs are only bred to other dogs of the same breed. This increases the chance that any two dogs will be related, and that they will carry a mutation that is “identical by descent”, that is, inherited from a shared ancestor. For this reason, most dogs in a breed with the same disease will share the same gene mutation. Further analysis showed that Case 1 had a different deletion in the same gene as Case 3. We hypothesize that the dogs have very similar phenotypes because the same portion of the protein coded by the gene is eliminated in the two different mutations. 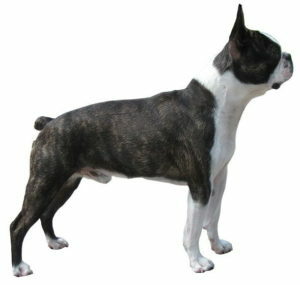 We screened 200 more Boston terriers from North America and Europe, as well as a large variety of other breeds, and these mutations were not found outside of these two cases and family members. This is good news for the breed, as it appears that these are “private mutations”, found only in these two families. 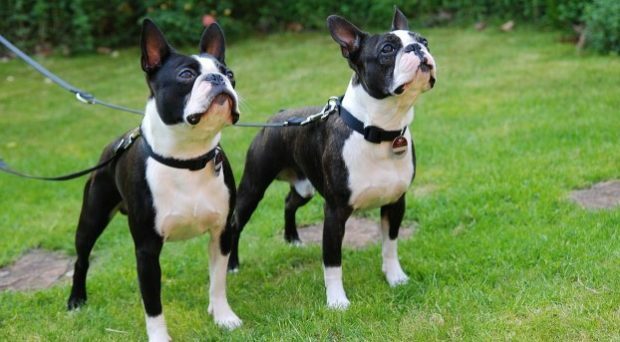 Although we have developed genetic tests for these two mutations, it will not be necessary for breeders of Boston terriers to add LGMD testing to their routine genetic screening at this time. This is also a good reminder to the animal breeding and veterinary community that even within one breed, a disease may be caused by more than one mutation. For this reason, it is best practice for testing laboratories to indicate which specific mutation(s) have been tested when writing reports. The disease is classified as Limb-girdle muscular dystrophy 2F (LGMD2F). The two mutations were found in the sarcoglycan gene SGCD, so the disease is classified as Limb-girdle muscular dystrophy 2F (LGMD2F) (in the muscular dystrophy naming system the number 2 denotes that it is an autosomal recessive gene, while F stands for the gene name). LGMD2F is the least common form of sarcoglycanopathy in humans, so our report of the first large animal model of sarcoglycanopathy may also be of interest to human medicine. The work also demonstrates the utility of whole exome sequencing to identify mutations in an extremely small number of affected animals. This allows mutations to be identified more quickly than in the past, as it is not necessary to gather samples from large family groups. The early establishment of a genetic testing program to distinguish between normal and unaffected carrier animals can therefore prevent a disease from unintentionally spreading through a breed population. Diese Forschung wurde in Zusammenarbeit mit Laboren der Clemson University, der University of California San Diego und der University of Helsinki organisiert. Um mehr über den LGMD Test zu erfahren, klicken sie hier.